"This bill we sign today is not a revolutionary bill. It does not affect the lives of millions. It will not restructure the shape of our daily lives." So said President Lyndon Johnson at the signing of the Hart-Celler Immigration Bill thirty years ago next month, on Oct. 3, 1965. The legislation, which phased out the national origins quota system first instituted in 1921, created the foundation of today's immigration law. And, contrary to the president's assertions, it inaugurated a new era of mass immigration which has affected the lives of millions. Despite modifications, the framework established by the 1965 act remains intact today. And, while the reform proposals now being discussed in Congress, the administration, and the Commission on Immigration Reform would reduce the total number of legal immigrants, they would maintain the fundamentals of the 1965 act — family reunification and employment preferences. So it behooves us on this 30th anniversary to look at the act and the expectations its sponsors had for it. Under the old system, admission largely depended upon an immigrant's country of birth. Seventy percent of all immigrant slots were allotted to natives of just three countries — United Kingdom, Ireland and Germany — and went mostly unused, while there were long waiting lists for the small number of visas available to those born in Italy, Greece, Poland, Portugal, and elsewhere in eastern and southern Europe. The new system eliminated the various nationality criteria, supposedly putting people of all nations on an equal footing for immigration to the United States. The new legislation (P.L. 89 236; 79 Stat. 911; technically, amendments to the Immigration and Nationality Act of 1952) substituted a system based primarily on family reunification and needed skills. Despite the noble words, the architects of the 1965 law did not see it as a means of significantly changing the immigration flow — it was considered more a symbolic act, an extension of civil rights sentiments beyond our borders. Proponents repeatedly denied that the law would lead to a huge and sustained increase in the number of newcomers and become a vehicle for globalizing immigration. Many senators and representatives believed that the new, equal quotas would not be fully used by European, Asian, and Middle Eastern nations. In addition, they did not foresee the expansion of non-quota admissions (those not covered by numerical limits) under the act's strengthened provisions for family reunification. The unexpected result has been one of the greatest waves of immigration in the nation's history — more than 18 million legal immigrants since the law's passage, over triple the number admitted during the previous 30 years, as well as uncountable millions of illegal immigrants. And the new immigrants are more likely to stay (rather than return home after a time) than those who came around the turn of the century. Moreover, this new, enlarged immigration flow came from countries in Asia and Latin America which heretofore had sent few of their sons and daughters to the United States. And finally, although the average level of education of immigrants has increased somewhat over the past 30 years, the negative gap between their education and that of native-born Americans has increased significantly, creating a mismatch between newcomers and the needs of a modern, high-tech economy. This paper offers a brief overview of the issues relating to the anniversary, including quotes from many of the participants, as well as an outline of the law's consequences. The liberalization of immigration policy reflected in the 1965 legislation can be understood as part of the evolutionary trend in federal policy after World War II to end legal discrimination based on race and ethnicity — essentially, the immigration bill was mainly seen as an extension of the civil rights movement, and a symbolic one at that, expected to bring few changes in its wake. In 1957, Congress passed the first civil rights law since Reconstruction, another in 1960, and two important bills in 1964 and 1965. Moreover, Supreme Court decisions and state and local laws also struck at the remnants of legal racism. The immigration bill was merely another step in this process. Established the basic structure of today's immigration law. Abolished the national origins quota system (originally established in 1921 and most recently modified in 1952), while attempting to keep immigration to a manageable level. Family reunification became the cornerstone of U.S. immigration policy. Allocated 170,000 visas to countries in the Eastern Hemisphere and 120,000 to countries in the Western Hemisphere. This increased the annual ceiling on immigrants from 150,000 to 290,000. Each Eastern-Hemisphere country was allowed an allotment of 20,000 visas, while in the Western Hemisphere there was no per-country limit. This was the first time any numerical limitation had been placed on immigration from the Western Hemisphere. Non-quota immigrants and immediate relatives (i.e., spouses, minor children, and parents of U.S. citizens over the age of 21) were not to be counted as part of either the hemispheric or country ceiling. Unmarried adult sons and daughters of U.S. citizens. Spouses and children and unmarried sons and daughters of permanent resident aliens. Members of the professions and scientists and artists of exceptional ability. Married children of U.S. citizens. Brothers and sisters of U.S. citizens over age twenty-one. Skilled and unskilled workers in occupations for which there is insufficient labor supply. Refugees given conditional entry or adjustment — chiefly people from Communist countries and the Middle East. Applicants not entitled to preceding preferences — i.e., everyone else. Although the 1965 bill was intended only to end discrimination, some people feared a major increase in immigration and a change in the source countries of immigrants. Supporters of the measure assured doubters that this would not happen. "First, our cities will not be flooded with a million immigrants annually. Under the proposed bill, the present level of immigration remains substantially the same ... Secondly, the ethnic mix of this country will not be upset ... Contrary to the charges in some quarters, [the bill] will not inundate America with immigrants from any one country or area, or the most populated and deprived nations of Africa and Asia ... In the final analysis, the ethnic pattern of immigration under the proposed measure is not expected to change as sharply as the critics seem to think." Senator Hiram Fong (R-HI) answered questions concerning the possible change in our cultural pattern by an influx of Asians. A few of the congressmen who opposed the bill did see that the new system, even with tight labor controls, meant a drastic change. "In light of our 5 percent unemployment rate, our worries over the so called population explosion, and our menacingly mounting welfare costs, are we prepared to embrace so great a horde of the world's unfortunates? At the very least, the hidden mathematics of the bill should be made clear to the public so that they may tell their Congressmen how they feel about providing jobs, schools, homes, security against want, citizen education, and a brotherly welcome ... for an indeterminately enormous number of aliens from underprivileged lands." "We should remember that people accustomed to such marginal existence in their own land will tend to live fully here, to hoard our bounteous minimum wages and our humanitarian welfare handouts ... lower our wage and living standards, disrupt our cultural patterns ..."
The 1965 changes unwittingly ushered in a new era of mass immigration. The current level of immigration is actually higher than the graph below indicates because illegal immigration is much higher now than ever before, with a conservative estimate of 300,000 new permanent illegal immigrants each year. The result is an influx of more than 1 million people a year, with no natural end in sight. Another factor in intensifying the impact of immigration is a reduced rate of emigration — that is, more of today's newcomers stay for their whole lives, rather than returning to the old country after a few years. 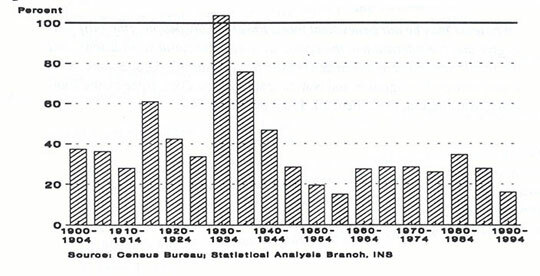 Note that in the 1930s, emigration was higher than 100 percent, meaning that during the Great Depression more people left the country than entered. Despite the protestations of the 1965 act's sponsors, the sources of immigration have changed radically. This is partly due to the fact that there are fewer people in Europe are seeking to leave, now that most countries there are modern and industrialized. The ending of the national origins quotas opened the doors to mass entry of people from Asia and Latin America (regions where people are far more likely to want to emigrate), and the law's emphasis on family reunification ensured that those through the door first would be able to bring in their relatives, freezing out potential immigrants from Europe and from other developing nations. 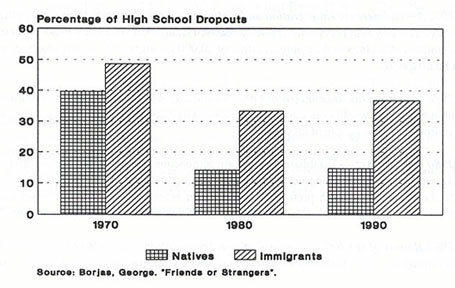 Although the percentage of high school dropouts among immigrants has fallen somewhat, the gap between natives and the foreign born has grown significantly, with immigrants more than twice as likely as native-born Americans not to have completed high school. This contributes to a growing pool of blue-collar workers competing for a shrinking number of well-paying jobs. 1882 Chinese Exclusion Act — Barred the entry of any Chinese for 10 years, made permanent in 1904 until it was rescinded in 1943. 1907 Gentlemen's Agreement — Barred the entry of Japanese and Koreans. 1917 Immigration Act — Passed over President Wilson's veto, it established a literacy test and created the "Asiatic Barred Zone," virtually prohibiting immigration from Asia. 1921 Quota Act (Johnson Act) — Set the first immigration quotas in the nation's history, equal to 3 percent of the foreign born of admissible nationality in the 1910 census. There was still no limit on immigration from the Western Hemisphere. 1924 Immigration Act (Johnson-Reid Act) — Set an annual ceiling of 154,227 for the Eastern Hemisphere. Each country had a quota representative of its population in the U.S. as of the 1920 census. 1952 Immigration and Nationality Act (McCarran-Walter Act) — Passed over President Truman's veto, it reaffirmed the basic provisions of the national origins quota system, and the annual ceiling remained 154,277. It abolished immigration and naturalization exclusions against Asians and allotted 100 visas for each Asian country. In addition, the act instituted a system to give preference (within the national origins quotas) to foreigners with education or skills, as well as relatives — this was the predecessor of today's preference system. Immigration from Latin America and the Caribbean remained exempt from numerical limits. 1965 Amendments to Immigration and Nationality Act (Hart-Celler Act) — See "Details" section of this paper. 1976 Amendments to Immigration and Nationality Act — Extended a version of the seven-category preference system previously applied to Eastern Hemisphere countries to all Western Hemisphere countries. Also imposed an annual ceiling of 20,000 immigrants from any one country in the Western Hemisphere. 1978 Amendments to Immigration and Nationality Act — The two hemispheric ceilings were combined into a worldwide quota of 290,000. The U.S. now had a policy that, on paper, applied uniformly to the people of all countries. 1980 Refugee Act — Established a separate admissions policy for refugees, eliminating the previous geographical and ideological criteria, and defining "refugee" according to United Nations norms. It abolished the seventh preference category for refugees (see Details). It set a separate target for refugees at 50,000 and reduced the annual worldwide ceiling for immigrants to 270,000. 1981 Report of the Select Commission on Immigration and Refugee Policy — The 16-member commission was created by Congress to evaluate immigration and refugee laws, policies, and procedures. The Commission's recommendations were summed up as follows by its chairman, the Rev. Theodore Hesburgh: "We recommend closing the back door to undocumented, illegal migration, opening the front door a little more to accommodate legal migration in the interests of this country, defining our immigration goals clearly and providing a structure to implement them effectively, and setting forth procedures which will lead to fair and efficient adjudication and administration of U.S. immigration laws." 1986 Immigration Reform and Control Act (IRCA) — Tried to control and deter illegal immigration by providing amnesty and temporary status to all illegal aliens who had lived in the United States continuously since before January 1, 1982; extended a separate, more lenient amnesty to farmworkers; imposed sanctions on employers who knowingly hire illegal aliens; increased inspection and enforcement at U.S. borders. 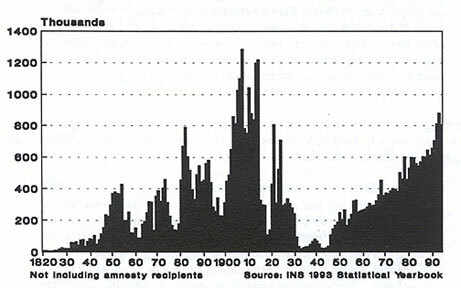 1990 Immigration Act (IMMACT) — Modified and expanded the 1965 act; it significantly increased the total level of immigration to 700,000, increasing available visas 40 percent. The act retained family reunification as the major entry path, while more than doubling employment-related immigration. The law also provided for the admission of immigrants from "underrepresented" countries to increase the diversity of the immigrant flow. Sen. Edward Kennedy, (202) 224-4543. He ushered the bill through the Senate. Sen. Robert Dole (R-KS), (202) 224-6521. Then a congressman, Sen. Dole voted for the bill. Sens. Strom Thurmond (R-SC) (202) 224-5972, and Robert Byrd (D-WV), 224-3954, voted no. Former President Gerald Ford, then a congressman, voted yes. Former Sen. Albert Gore Sr., the Vice President's father, voted yes. Former Sen. Eugene McCarthy voted for the bill in 1965, but has since criticized the direction of U.S. immigration policy. Others who voted for the 1965 bill: Sen. Daniel Inouye (D-HI); Sen. Claiborne Pell (D-RI); Rep. George Brown Jr. (D-CA); Rep. Sam Gibbons (D-FL); Rep. Patsy Mink (D-HI); Rep. Sidney Yates (D-IL); Rep. Lee Hamilton (D-IN); Rep. Andrew Jacobs Jr. (D-IN); Rep. John Conyers Jr. (D-MI); Rep. John Dingell (D-MI); Rep. Joseph McDade (R-PA); Rep. Henry Gonzalez (D-TX); former Sen. George McGovern; former Rep. Dan Rostenkowski. Others who voted against the bill: Rep. James Quillen (R-TN); Rep. E. (Kika) de la Garza (D-TX).